There is a blogging event called Forever Nigella organised by Sarah on Maison Cupcake. The idea is to make a recipe by Nigella Lawson following a theme that changes each month. This months theme is “Seduced by Chocolate” With such a delightfully titled theme I couldn’t resist! While doing maths at school a wonderful little girl I know calculated that she would be 100 months old on February 10th this year. 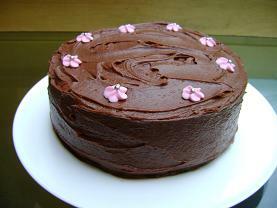 Well that seemed to me the perfect excuse to bake a cake and to be “Seduced by Chocolate” at the same time! Nigella Lawson, like myself, seems to be a fan of chocolate and as a fan of Nigella’s I have over the years made a few of her chocolate recipes. This time I wanted to make something I hadn’t tried before so I chose Nigella’s Old Fashioned Chocolate cake from her Feast book. I am often disappointed by chocolate cake recipes, they often sound so promising but once baked do not live up to my expectations. I’m always on the hunt for a chocolate cake that tastes like chocolate cake tasted when I was a kid. Well I grew up in America and I remember my mother baking lots of cakes. The fact that all these cakes came from a Betty Crocker or Duncan Hines box did not seem strange at all to me! So when I read that Nigella describes the Old Fashioned Chocolate Cake “as a sort of idealised chocolate cake out of a packet” I felt hopeful! Well this time I was not disappointed. It such an easy recipe to follow, literally an all in one mix (like one out of a box!) It was such a satisfying cake to make, it rose well and tasted as I wanted it to of chocolate! It’s a lovely light cake with rich, decadent frosting, I loved it. But most importantly so did the 100 month old! This entry was posted on February 19, 2011, 18:48 and is filed under Baking. You can follow any responses to this entry through RSS 2.0. You can leave a response, or trackback from your own site. I can’t tell you how many times I’ve made this cake – it’s a terrific celebration cake and I’ve never met anyone who didn’t like it. Your’s looked a bit neater and prettier than mine usually are though. Thank you! I think it will be a regular of mine now. Wonderful web site. Lots of useful info here. I¡¦m sending it to several buddies ans additionally sharing in delicious. And certainly, thanks on your sweat!